When Trevor and I started writing a series based on the 2008 version of Sid Meier’s Colonization, we knew that the issues we wanted to discuss were already controversial. Trevor’s initial post discussed the fervor with which bloggers reacted to the game’s release, and he argued that games about colonization should be offensive if they are meant to represent a colonialist ideology. We explored key issues of representation and player agency in previous posts about how Natives are defined in the game’s code and represented in the game’s art and mechanics. What we did not expect was for game developers to interpret our analysis of games and code as a form of attack; and perhaps we should have explicitly stated that we do not blame game developers for the offensive nature of the game. After all, a game about colonization should be offensive, and its assets and code are going to reflect that. 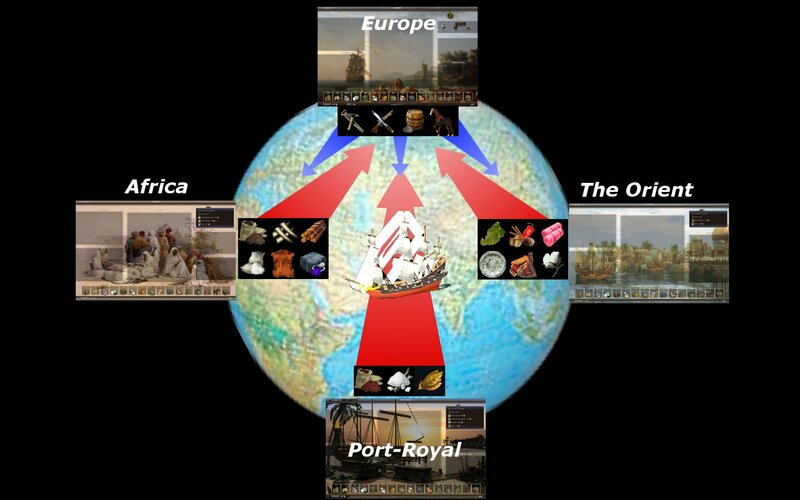 Civilization IV: Colonization (Civ IV: Col) does not include the triangular trade, one of the most important and offensive series of events in the history of the Atlantic. As Trevor said previously, we are not begrudging the developers for this omission. Popular culture is deeply disconcerted by the history of slavery, and a game already facing criticism for being offensive would likely raise far more criticism for letting players “play at” the slave trade. We should note that slavery (and whether or not a player’s colony supports it) does make a brief cameo appearance in the game. After players declare their independence, they must create a Constitution by making a series of binary choices; one of those choices is whether or not “All Men are Free.” Allowing slavery gives a +25% boost to raw material production (tobacco, cotton, wheat, etc. ), while abolishing slavery gives an immediate population bonus of two Indentured Servant units for each of the player’s settlements. Slavery is a single decision that has immediate consequences, but not a major part of the game’s mechanics. Slavery and racial inequality are still sensitive issues for people living in the United States, and as comedian Louis C.K. has pointed out, we like to mentally distance ourselves from that past. But if games are meant to be a series of interesting decisions (as Sid Meier once said), and if we are supposed to be serious about the potential of historical games, shouldn’t we let people explore offensive and controversial identities and roles? Yes! But cultural norms, commercial interests, and personal discomfort have all been barriers (and will continue to be barriers) in facilitating that exploration through video games. Firaxis invites its players to changethe the game through modifications or “mods.” Interestingly, the modding community has created (or attempted to create) several different mods for the game that bring slavery and the slave trade into the game. 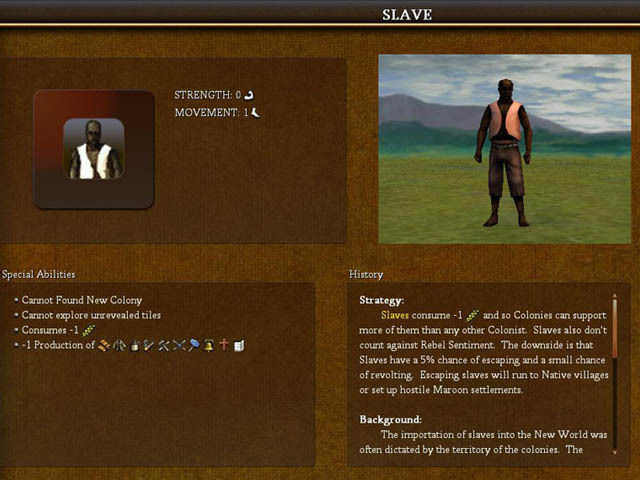 Civilopedia Entry for the "Slave Unit." Image by modder Dom Pedro II. Can you imagine how powerful it would be if the game forced players to make decisions about trade routes in Africa? If it forced them to think about the results of the commodification of people but still presented information about those who died in transit and died from disease and starvation in colonies? There are actually four mods (in various states of creation) where players are meant to explore what Colonization would be like with the slave trade included: “The Triangle Trade” by Dom Pedro II, “Slavery Market. The Orient. Port Royale.” and “1492: Global Colonization” by KJ Jansson, and “Religion and Revolution,” currently being developed by a team of modders at Civ Fanatics. In the rest of this post we describe some of the mods’ features and offer preliminary interpretation. We invite any readers to share their thoughts and interpretations with us in the comments. In November of 2008, little over a month after the game’s release, Dom Pedro II began his Triangle Trade modification with the intention that in the final version of the mod, players would be able to purchase Slave units in Africa to bring back to the New World. Slaves were meant to consume one less food than the Free Colonist, meaning that a settlement that could support more Slaves than Free Colonists. 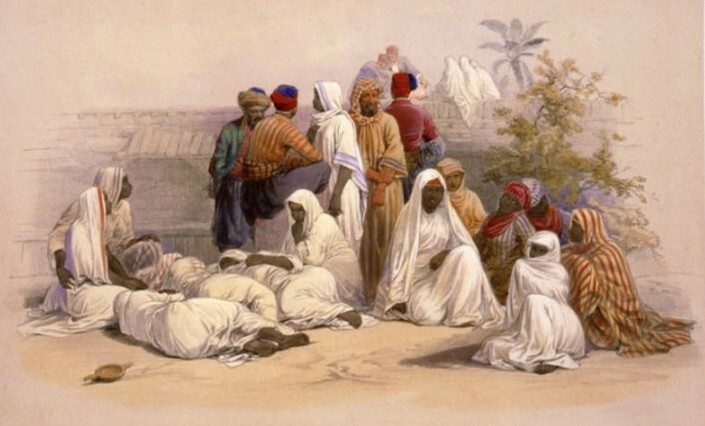 Slave units would have the capability to escape and join a nearby Native village or found their own settlements near the player’s colonies, providing a challenge for those engaged in the slave trade. Escaped slaves would have their own civilization called the Maroons, whose leader was the historic figure Zumbi. Dom Pedro II wrote, “They will be hostile and will harrass [sic] your colonies until you crush them.” While players would not have to face the problem of slaves dying from disease or transit, the inclusion of the slaves’ own civilization and possibility of revolt would present information about the culture and struggles of the same “units” that players would have treated as commodities. Dom Pedro II intended these penalties and challenges for players that engaged in the slave trade, but there would be obvious advantages as well; producing more raw resources aids in raising money, which players could use to expand cities and their military. Dom Pedro II planned on including three different victories: Financial, Military, and Diplomacy (in the original version of the game, the game can only be won through a successful revolt). Within the thread where Dom Pedro II discussed his modification, other members of the forum referred to examples of how slaves were treated in various locations (Haiti, North Carolina, Brazil) to serve as inspiration for developing algorithms for slave revolts. Much like modders thinking about how to more accurately model the history of science and technology, these Civ IV: Col modders attempted to develop more accurate models of the game, illustrated by their willingness to gather historical evidence to support their design decisions. Unfortunately the Triangle Trade mod is no longer playable, except for those who installed the game before March 2009 and did not install Firaxis’ first and only patch for Civ IV: Col. Additionally, the Slave units and Africa screen were never implemented despite lively discussions and community support for the mod. Dom Pedro II seems to have disappeared, never to return and update his mod. The inclusion of the slave trade in Civ IV: Col proved too important to let it rest with an unusable and unfinished mod. In April 2010, modder KJ Jansson created the mini-mod Slavery Market. The Orient. Port Royale. This mod was based on Dom Pedro II’s Triangle Trade and later included in KJ Jansson’s 1492: Global Colonization. KJ Jansson explained that these mods compensate for the shortcomings of the original version of Civ IV: Col. Slaves can be purchased in Africa, the Orient, Port Royal, and occasionally Slaves “immigrate” to the New World like other colonists and professionals (meaning they cost nothing). "Idea of Intercontinental Trading." Image by modder KJ Jansson. Balancewise I think Slaves are very powerful, perhaps too powerful – a unit consuming only have the usual food is a tempting thing and as it is currently there seems to be no downside (except the comparative low one-time cost of 150 or 300). You can use them w/o a limit, there is no restricted supply…on the top they are better then normal units in ressource [sic] harvesting. I wonder if that bonus is really needed? I would suggest to add also a kind of revolt danger, if you go overboard with them in a colony. I was able to explore this mod for myself, but only after having major technical Mac-related difficulties, which speaks to the difficulties in game modification and the fact that many mods are inaccessible for most Civ IV: Col players. What I noticed was that slaves are best used for raw material production, and so depending on how many settlements the player creates, there is a limit to the amount of slaves that the player might import. For players with many settlements, slaves are invaluable; their resource bonus and lower food consumption make them an easy source of labor. Additionally, since slaves “emigrate” from Europe for no cost, the mod forces the player into taking part in the slave trade. If the player finds this disturbing, s/he may send slaves to train in Native American villages to earn their freedom. Otherwise, there is no reason not to use Slaves. A note on the “emigration” of slaves from Europe: I believe they may have been coded that way because it is similar to how colonists are introduced into gameplay, although it is a bit odd and obviously incorrect to have slaves “immigrating” to the New World. So my suggestion to KJ Jansson would be to either force players to pay for the Slaves coming out Europe or not allow Slaves to be purchased in Europe at all, both to give players more choices and for historical accuracy. Additionally, without any penalties for using Slaves, I am ashamed to admit that I forgot that I was using Slave units at all; I just bought them, placed them in settlements, and used them, like any other unit. But perhaps that was a valuable learning experience, too; when the Dutch colonized New Amsterdam, they engaged in the slave trade because it was generally considered to be a normal part of life. My own upbringing prevents me from understanding that way of life, but as I focused on commerce and revolution in the game, I found myself falling into the same mindset that I imagine many Dutch merchants had when engaging in business affairs. 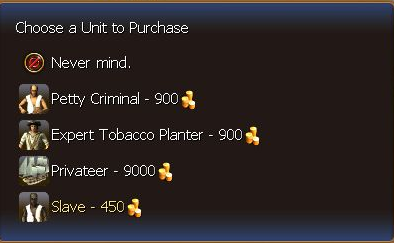 Why is it so hard to include Slave unit? Why is it so hard to include a Plague mechanics [sic] which would wipe up entire (and very useful) villages of Natives? If the mod would call itself — Beautiful Colonization — I would agree. But Authentic? Make things ugly, please [Backstab emoticon] or change the name [lol emoticon]. One of the mod’s developers explained that if some team members are completely against a feature, then it is not included, slavery being one such “hot topic.” Diseases might be included in the next release of TAC, but as Ronnar pointed out, diseases are hard to implement because, “if you do not have a cure/counter, then human players will not like the feature.” This version of TAC has not yet been released, and the mod team for Religion and Revolution (which will include the slave trade) has promised that they will not release their first version until the next (and final) version of TAC is released. Since modding is a hobby, there are no formal release dates in sight. Until then, players can experiment with KJ Jansson’s Slavery Market mini-mod, if their computers oblige. Units for sale in Port Royal. Image by KJ Jansson. Tigranes’ accusation that “The Authentic Colonization” is, in fact, a “beautiful colonization” since it does not include plagues or the slave trade is fascinating. Beautiful colonization—what a disturbing turn of phrase! When we stack up the various mods of the game and design decisions for including slavery, we aren’t really sure what it all means. Should we be excited by the fact that there is a community of individuals out there trying to make more offensive and more accurate versions of the game, versions that potentially force players to confront the dark past that is colonization? Clearly these mods show us alternate visions of what the game could have looked like, but they also tell us something about what parts of the player community want to see in the game. Beyond this, what do these mods tell us about the game itself? The game was designed in such a way to invite and encourage this kind of modification, but what does that mean for interpretation of the original game? Does this make the original game’s shortcomings forgivable? Does it remove the game development team’s responsibility in representing an “authentic colonization”? These are questions that we pose to readers and ourselves, and that we will continue to consider in further posts. One of the great drivers of these modding communities for strategy games (be it for Civ, Total War or the Paradox games) is historicity, at least in my experience (I’m most familiar with the Paradix mods). While players will recognize white-washing of history, the motivation to add to a game is almost always “x is not in the game, how dare they”, regardless of the morality of x. It seems these missing stage props irk a fair number of players and I’ve seen suggestions for mods that would essentially turn the games into history textbooks. In most cases, x is added, then designed to offer more possible actions to the player and then balanced so that the game remains playable. Which also means there is hardly ever an intent to confront players or allow them to explore problem spaces (again, in my experience). With an issue like slavery, the moral debates get mixed up with the desire for historicity, but there are other examples where the stage prop character becomes much more clear. For the recent Crusader Kings II, there are no less than three mods which attempt to make the strategic map, its provinces, strongholds, cities and bishoprics as true to history as possible. I’d suggest that you can see the stage prop element in all the mods you cited above, especially when the slave units were so unremarkable that you forgot they were slave units at all. Wether the moral dimension of slavery generally complicates that stage prop character to such an extent that slavery is not implemented at all or wether most modders didn’t even consider implementation is an interesting question too. On the company side, I think companies indulge their audience by making their games moddable, because it is a selling point (desire for historicity), but also because it helps build a community that will play the game long after most other games will have been shelved. This was my first time playing any mods or doing any sort of research concerning the community and its work, so I had not heard of the “stage prop” effect before. Thank you for explaining that – I think it does explain my experience forgetting about slave units! I also agree with you that the stage prop effect applies to the other mods Trevor and I wrote about. However, Dom Pedro II’s unfinished Triangle Trade mod showed potential beyond the stage prop, especially since there was an effort to make engaging in the slave trade have serious repercussions. It reminds me of the decision that the original developers made regarding horses and guns – if you (or other colonizers) don’t trade them with Natives, the Natives won’t be able to use horses or guns. Good point about community building as a motivation for companies to make games moddable. I listened to a podcast that aired before the game was released, in which some of Civ IV: Col’s developers joked that modders were probably already creating mods that would make the Portuguese playable. So they “get” that their game is going to be changed and that they can’t provide everything that every player will want. I think it is important to note that some of the most popular (based on votes and downloads) Civ IV: Col mods are not exactly motivated by the desire for historic authenticity. There’s a medieval themed colonization mod in addition to a futuristic space colonization mod (in which the Natives are playable!). I should add that I made the term “stage prop” up to explain this situation to myself. I do not want to pretend it’s somehow common parlance. It is not all negative either, even though it can sound condescending, it does show that people think about the game and the picture it presents. Maybe having slavery in the game is always better than not having slavery in the game. Sometimes games use stage props too. Sometimes the stage prop nature is also a result of it being a mod. The modders simply preferred working on other areas and issues or stopped working before they finished the mod (as seems to be the case with the Triangle Trade mod). Maybe it is unfair to compare mods and commercial products by applying the same standards in that regard. All the more impressive when a mod achieves more than the game did, as Triangle Trade seems to have done. I did not intend to imply that all mods were inspired by history or historical accuracy, I am sorry if it read that way. You are right, some of the most exciting mods are not historical (the Game of Thrones mod for Crusader Kings II comes to mind!). Ah, thanks for the clarification re: stage prop. I still think it’s a helpful term and that it should be integrated into common parlance! I don’t think the term is inherently negative and I didn’t mean for it to come out that way. Props are needed in order for people to understand what’s going on (and when) in games (or theater). My gut instinct is that something as sensitive and important as slavery should not be a stage prop, because people should be reminded and challenged on their decision to engage in the slave trade. Not only does this make the game more compelling, but it treats the subject matter more seriously. However, I could also argue that having slavery be “just another part” of everyday life to colonizers also holds historical value and relevance (I mentioned this in the post, too). But I don’t think that most users would come to that conclusion, and I don’t think it’s the best conclusion to come to, either. I agree that it is unfair to compare mods and professional games by the same standards; they are made in completely different settings. Modders are “governed” by their community moreso than commercial demands and they’re modding as hobbyists in their free time. Then again, I noticed that many modders like constructive criticism and serious feedback. I tried to include a bit of that community feeling in the post, too. Since modders can continually make revisions and discuss the problems of their work openly, it’s more difficult to criticize their decisions. Firaxis isn’t as transparent about the decisions that went into making Civ IV: Col, so it’s easier for people to speculate, jump to conclusions, and complain. Also, it sounds like I need to play Crusader Kings II!